Would you do them for an outdoor wedding (provided no wind)? If so, when should they be done? We were just planning to have plates and silverware (all plastic) at the buffet. Seeing some of the photos of the nice place settings is making me want to set the places out, but not sure it's practical. Thoughts? 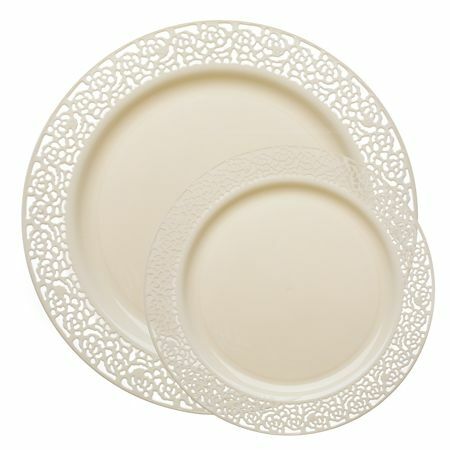 We are using these plates... http://www.smartyhadaparty.com/Lace-Ivory-Plastic-Dinnerware-Value-Pack-i10562.aspx. The large size for dinner and the small size for cake. Super stoked. We are using the faux silver forks and such - my mom tested them out for Thanksgiving and everyone thought they were real until they picked them up! And the napkins are paper, dinner-sized in 14 different springy colors. So I definitely think it would make a cute table, but then I'm also wondering if it's sanitary, etc. The tables will be under a tent, but the tent doesn't have sides (unless it rains). The plates are really cute but I would worry about wind as well since they're plastic. If you're doing favors you could put them on top of each plate as a sort of paper weight. But if it's a buffet, i would leave the plates up by the food and get chargers to make the tables look pretty. People will forget to bring their plates with them and the buffet will take longer if they have to go back to their table and get their plates. Chargers will still make things look put together and pretty. The plates look very pretty. I don't think you have a sanitation problem with them being put out hours in advance since there is a canopy over top. Honestly, I'd be more concerned with effectiveness over appearance. Plastic forks and knives IMO are basically useless on most types of food that need to be cut. For example, stabbing pasta = fine, cutting meat = a super PITA and embarrassing for me to try to saw away with a sub-par piece of equipment that just can't get the job done while I'm trying to be classy in cocktail attire. Now I have to either not eat it, pull it apart with my hands, or keep fighting it, and/or risk breaking the utensil. I really hate plastic utensils in these scenarios. It keeps me from feeling able to have proper table manners. The plates are really cute but I would worry about wind as well since they're plastic. If you're doing favors you could put them on top of each plate as a sort of paper weight. But if it's a buffet, i would leave the plates up by the food and get chargers to make the tables look pretty. People will forget to bring their plates with them and the buffet will take longer if they have to go back to their table and get their plates. Chargers will still make things look put together and pretty. That's a good idea! I'll scout around and see if I can find any cheap. Yeah, I hear you! We are having casual BBQ food and all the meat will be pulled (no brisket or anything). We used them for Thanksgiving Day and they held up fine but if I were serving chicken breast or steak or another large cut of meat I'd definitely consider something else. leave them at the buffet. Wind can come out of no where. And honestly it's weird carrying empty plates all over the place just so the couple can get a a few pretty pictures that will barely, if at all, even make the cut to be put in the album. It's way more efficient to leave them at the buffet. My photo package is stripped to the bone for budget reasons so I sincerely doubt we will have pics of our tables haha, at least not ones without guests at them. I just meant visually speaking for people to see, in real life. I think I will leave them at the buffet; it seems more practical. We aren't doing favors so no paperweight option, and the chargers look to be a dollar a piece at the cheapest; we're having 96 chairs for 75-80 guests (open seating) so $100 is a lot for something unnecessary.